Synopsis: Every step of Saba's journey sizzles with danger... In a lawless land, where life is cheap and survival is hard, Saba has been brought up in isolated Silverlake. She never sees theangers of the destructive society outside. When her twin brother is snatched by mysterious black-robed riders, she sets out on an epic quest to rescue him. The story's searing pace, its spare style, the excitement of its fabulously damaged world, its unforgettably vivid characters, its violent action and glorious love story make this a truly sensatonal YA debut novel. They came on the eve of a sand storm: riders in black. They burst into their lives like the rupturing of a balloon, taking Lugh and murdering Pa. Now Saba and Emmi are on a reconnaissance mission to rescue their beloved brother from the clutches of a distant king. They’ll travel desert and mountain, through fire and rain to get him back, making friends and enemies. They will fight for Lugh with their lives and nothing will stand against them. There are few novels that leave you breathless and thirsty for more. Even fewer rip through you like a storm. Blood Red Road is one of the these; a formidable journey of epic proportions that spans love, anger, and pain. Sometimes, there is a feeling you get when reading an outstanding novel where you forget you are simply reading words off a page and instead you fall into the fictional world and become part of the journey. Right from the start Blood Red Road gives this impression, and there is a very good reason for this: Moira Young’s prose is absolutely fantastic. It is absorbing, concise, authentic, and most of all encapsulating. Young’s prose is very different from that of any other author. Telling the story from Saba’s point of view, Young replicates Saba’s speaking style: missin’ letters off words, usin’ doubtful grammar an’ forgettin’ speech marks all together. She ain’t afeared to do that- and it works a bomb. The effect is that of a verbal storyteller; the boundaries between speech and prose are knocked down to create one phenomenal storytelling experience. Moira Young is a master writer, and she really knows what she’s doing. 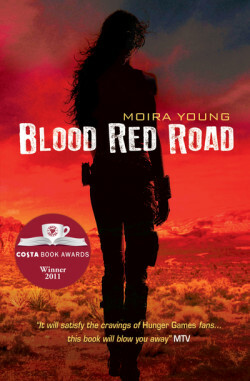 Though Blood Red Road may seem very plot-orientated, it is filled with plenty of fascinating characters: Saba, an angry but loving eighteen year old, and Emmi, her stubborn yet scared sister, and Jack, their cocky, flirty, strong companion. Each character is individual, human in their own way. Moira Young hasn’t overlooked relatively minor characters either, and this attention to detail only improves the novel. Undoubtedly, Blood Red Road is the very best when it comes to characters, and I have a feeling authors will be very jealous of Young’s ability to fashion such fascinating and honest characters. Whilst Blood Red Road may start out relatively slow, within about 50 pages the pace picks up to a delightfully fast rate and the riveting plot starts to take over. Rescuing Saba and Emmi’s brother from his captors may sound quite simple on paper, but throw in an long journey, a capturing, and an attack with hundreds of weird, worm-like creatures, and it soon becomes an increasingly exciting rip-roaring adventure. Blood Red Road may technically be a dystopian novel, but to bind it to one genre only would be folly because it is truly an amalgamation of all the best in many a genre. This is an impressive first novel; perhaps one of the best début novels I have ever laid my hands upon, and it is only right to congratulate the incredibly talented Moira Young for this accomplishment. Blood Red Road is a sure contender for the best book of 2011, and I beg everyone who hasn’t yet read it to pick it up and lose themselves inside its pages- you won’t realise the time that flies by! What did you think about Blood Red Road?